The recent Varsity Blues college admission scandal is merely a glimpse into the inequities of a rigged system that marginalizes millions of our youth and perpetuates the destruction of what was once known as “The American Dream.” We are living in an era of a dwindling middle class and growing class of poverty that both cling to increasingly obsolete ideals: that pathways to opportunity are open to them. Instead, selfish elites with privilege and power take advantage of the system by using loopholes, some of which are actually legal. As a public high school teacher, I am pulled in two different directions. One is to convince students that if they work hard in school and achieve good grades and high test scores, they will have multiple opportunities to “succeed” in life. This is the mantra of the system: to be “college and career” ready. If I were to be completely compliant as a Department of Education employee, I am to lie to my students that they must strive for college admission because that will lead to a sustainable income, home ownership, and a relatively stress-free life. However, I have followed that path myself and am saddled with student loan debt, exorbitant credit card debt, and little hope to own a home. The second direction is to tell students the truth: that they need to weigh the cost of a college education with the potential income they might receive after researching the job outlook and factoring in the geographical location where they intend to live as an adult. Another way to guide students that is highly neglected is to teach them about entrepreneurship and ways to start non-profit organizations that aim to better the world. Instead, students participate in community service activities to pad their college brag sheet rather than to improve their world. This obsession with “college and career ready” perpetuated by the neoliberal agenda is leading students to aim low. If I ask any class of students the purpose of education, the overwhelmingly popular response is “to go to college and get a good job,” just what the shrinking number of large corporations want to hear. The elites do not welcome competition for their positions of power, rather they want a workforce they can control. More frightening is the reduced quality of leadership we are experiencing which is a direct result of a privileged class buying their way into power and then leading with a blind eye to the plight of those who are struggling. A perfect example is the suggestion that federal government workers work odd jobs and borrow against their retirement to survive during the government shutdown earlier this year. The trend to neglect funding for public education is being felt firsthand by veteran teachers like me. Students in schools with a lack of funding often do not know anything else but to deal with the scant resources. 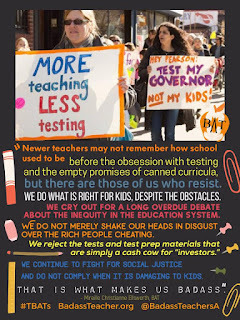 Newer teachers may not remember how school used to be before the obsession with testing and the empty promises of canned curricula, but there are those of us who resist. We do what is right for kids, despite the obstacles. We cry out for a long overdue debate about the inequity in the education system. We do not merely shake our heads in disgust over the rich people cheating. We reject the tests and test prep materials that are simply a cash cow for “investors.” We continue to fight for social justice and do not comply when it is damaging to kids. That is what makes us badass. What a wonderful article! I do not understand why there are no enthusiastic comments to it. Well, this is even better, for I intend to correct such an injustice immediately. I absolutely agree with every word of the author and I am ready even now to put my signature on any of them. Such a “readiness for college and career” in my youth blinded me, like many of my peers. But I was powerless to do anything, because my parents instilled in me this idea from my birth. But if you count the cost of college... Who knows, it can really be better to find the right person for doing homework for money , get a grade, and spend your own time on really useful classes that will prepare you for the real life? Now is the time to seriously reconsider our attitude towards education and reform the educational system.